Trim the sprouts and cut in half. Heat the oil in a large wok or pan. Stir-fry the sprouts for 1-2 minutes. Add the stock and continue cooking for a further 2 minutes. 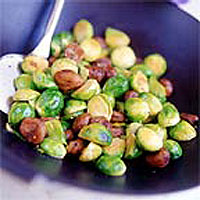 Add the chestnuts and cook for another 3-4 minutes or until the sprouts are just tender but still bright green and crunchy. Season well to taste.